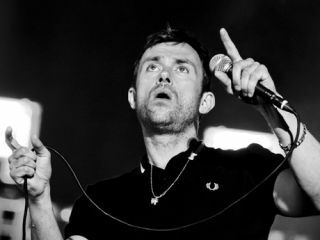 Blur are said to be hitting the studio sometime in January, with plans to release a full-length album by the end of 2011. Which makes frontman Damon Albarn one busy bee: in addition to releasing the Gorillaz disc Plastic Beach earlier this year and touring behind the record, he's got another CD (recorded on an iPad!) ready for public consumption on Christmas. The group reunited in 2009 to much fanfare for a string of huge outdoor festivals, and they even recorded a single, Fool's Day, which was issued last April for Record Store Day. According to a source who spoke to The Sun, "When they went into the studio earlier this year everyone was really pleased to discover that the old magic was still there. They would have liked to have done more, but Damon could not take part due to his commitments with Gorillaz. Now that he's finished touring with the band, he has more time on his hands." Earlier this year, Albarn said that last year's shows "healed a very deep wound for all four of us."